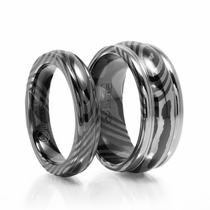 A wedding set is a true symbol of commitment to each other. 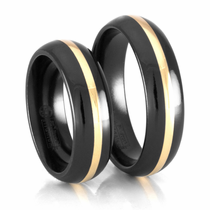 It is a classic, timeless look for couples. 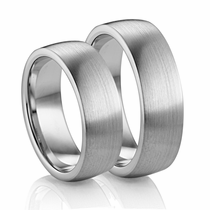 Browse our selection of modern sets. 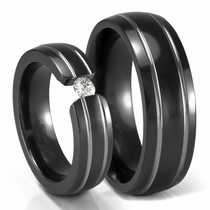 All rings come with a 30 Day "Love it or Return it" privilege. 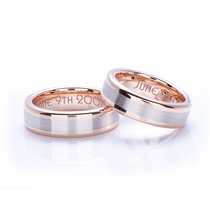 Want wedding rings that show your true commitment to each other? 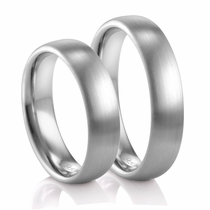 Choose a set of his and hers matching wedding bands from Titanium Jewelry. 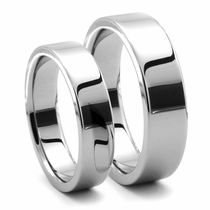 These rings act as a meaningful symbol that ties the two of you together. 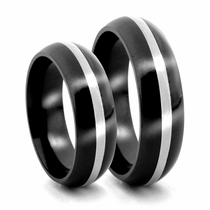 By having a matching set, you and your new spouse will feel more connected than ever. 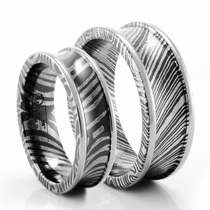 Plus, you can find a style that suits your tastes in this collection from Titanium Jewelry. 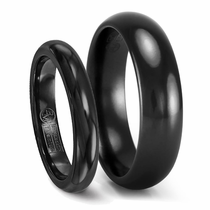 You�ll find a range of unique looks and rings made from various durable materials, ensuring that there�s a great fit that you and your new husband or wife will love. 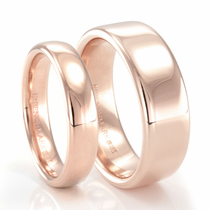 Unlike a decade or so ago, today�s rings extend far beyond the traditional gold or silver. 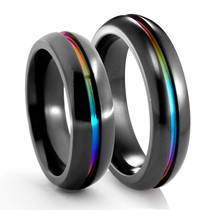 That means that modern couples can get a ring that actually expresses their true style, whether it�s sleek, chic and understated or full of glitz and glamor. 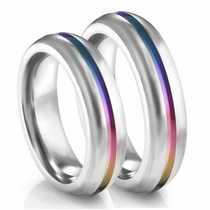 These wedding ring sets are unique in that they fit both a feminine and masculine look while still matching together seamlessly. 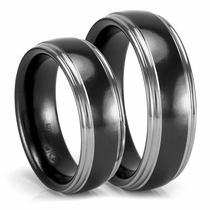 For example, you can get a beautiful set of matching titanium wedding bands that have a glossy finish for a pop of shine while maintaining a minimalist look of plain black. 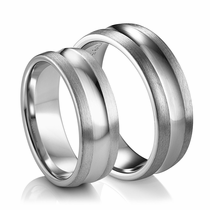 For a lighter appearance, go with ultra-bright white cobalt chrome wedding bands for your matching set. 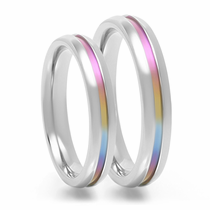 Those who want some color in their rings can opt for a set of rose gold and palladium bands or matching wedding bands his and hers titanium rings with a unique rainbow inlay. 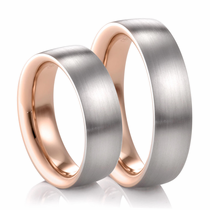 When you first start looking at wedding bands, it can be a little overwhelming. 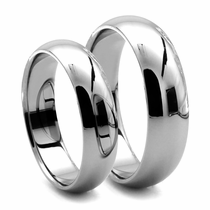 But at Titanium Jewelry, finding a great fit for both you and your spouse is easy. 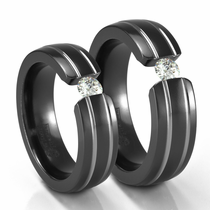 The selection includes options from some of the top jewelry designers. 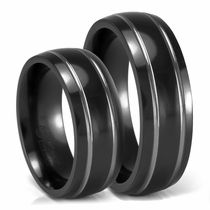 And like the name implies, these rings are made only with ultra-durable materials like titanium, so you know they�re built to last a lifetime. 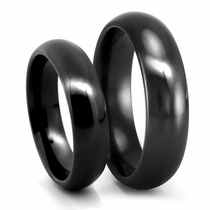 We also include a 30-day money-back guarantee to ensure that you can enjoy a hassle-free return process if you don�t absolutely love your new rings. 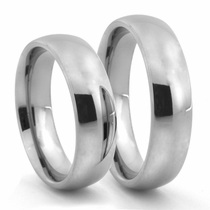 Customer rating for Matching Wedding Bands by Titanium Jewelry: 5 of 5 based on 45 customer reviews.